Here’s another edition of the Food Network’s Summer Soiree – this week’s topic is no-bake desserts and boy do I have a doozy for you! Nothing to bake or cook, throw them together and you can have these on the table in just a few minutes. 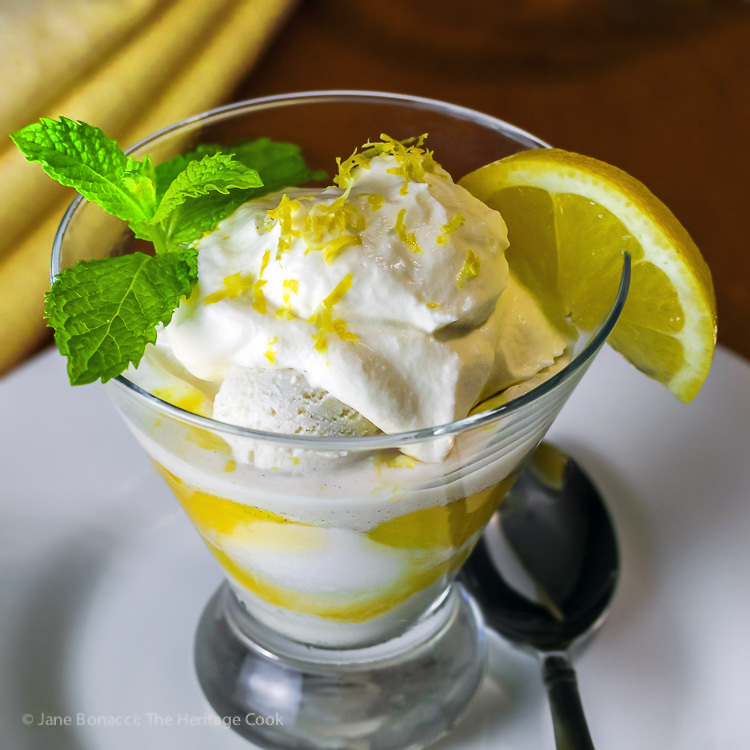 That’s why I’m calling them the World’s Easiest Lemon Curd Parfaits! If you have a last minute party or decide to invite friends over for dinner on the spur of the moment, this is the perfect dessert to serve. A quick stop at the store and you have all the ingredients you need. A few minutes prep and they are all ready to go! You can even enlist the aid of your guests and have the give you a hand – an assembly line will have these made in no time and everyone loves being part of the party! If you’ve never tried lemon curd, you are in for a real treat. It is a thick lemon spread perfect with scones, cookies, biscuits, crumpets, muffins, and more. It is the cornerstone of a quintessential afternoon tea common in Britain, Ireland, and other Commonwealth countries. When attending a tea in this country, you typically get dressed in your finest and enjoy a few hours of laughing and sharing with friends. You can make your own lemon curd (recipe here) or use store-bought. Lemon curd is freshly squeezed lemon juice cooked with sugar and egg yolks, thickening as it heats up. Whisking butter into the thickened mixture creates a luscious pudding-like concoction. Once you’ve made your own you’ll know how easy it is to make and you can control the ingredients and level of sweetness. All you have to do is stir the mixture while it is cooking. For an impromptu dinner party, make a quick stop at the store to pick up these ingredients and dessert is virtually done! Calling these parfaits may be a bit of a stretch because they don’t contain any cake, biscuits, or other baked goods. But the layers of vanilla bean ice cream and bright yellow curd in glasses were too beautiful to just call this a sundae. When I get home after having dental surgery today, I’m sure having one of these waiting for me will make the pain just a little easier to handle. Plus they are easy enough for The Artist to quickly put together, and your children can make these when they want to do something nice for you! You can whip the cream ahead, cover, and refrigerate for a day or two head. If it separates, just whip it up again to recombine. This can save you time when your friends and family are in a hurry to dive into these! It also makes it easier to serve homemade whipped cream instead of the chemical-laden pre-whipped versions. A little tart, a little sweet, a little creamy, and a lot of delicious! Soften the ice cream just a little to make it easier to scoop. Place a scoop of ice cream in the bottom of a parfait glass. Top with a dollop or two of the lemon curd and another scoop of ice cream. Add two more dollops of lemon curd and top it with a little whipped cream. Zest a little lemon peel over the top, set a lemon wedge on the edge, and tuck in a sprig of mint. Add a spoon and serve immediately. That's all there is to it! Now go and enjoy these! This recipe is part of Food Network’s weekly Summer Soiree Fest celebration. See the links below for this week’s inspiring recipes and check out our Pinterest page for even more ideas! Let’s connect! If you ever need any entertaining or cooking advice, need to alter a recipe for gluten-free, or want recipe suggestions, don’t hesitate to email me. Feel free to quote me, just give credit where credit is due, link to the recipe, and send people to my website. Unauthorized use, distribution, and/or duplication of proprietary material from The Heritage Cook without prior approval is prohibited. This includes copying and reprinting content and photographs. If you have any questions or would like permission, I can be contacted here. The suggestions here are not intended as dietary advice or as a substitute for consulting a dietician, physician, or other medical professional. It is the reader’s sole responsibility to determine which foods are appropriate and safe for their family to consume. The author makes no claims regarding the presence of food allergens and disclaims all liability in connection with the use of this site. Please see the Disclaimers page for additional details. Thanks for joining the Heritage Cook Family!